How to survive this Bearish New year in crypto BearLand. So the year 2018 has finally come to an end and none of us become millionaires (BTC-crypto holders). Around same time last year every one was saying that BTC can reach almost a million dollar soon if not, than it will definitely be $50K+ by 2018 end. Crypto gold rush was supposed to ride through this year giving all early holders mad returns , well it gave mad returns but on the downside. Most of the year was bearish one, still bullish ride seems distant and remote. Travelling around here and there crypto has reached in chilling, dry Bearland, still trying to find a way out, hopefully upcoming year 2019 is will get crypto world out of this chilly, cold BearLand , but there is no miracle around so bearish winter is expected to continue for a while. Since it is to continue lets get ready to survive this too, else loss is around the corner. Meanwhile we managed to salvage a lost snap of bear land. watch below. An earlier snap from Bearland before weather became bad, whales had already travelled far. 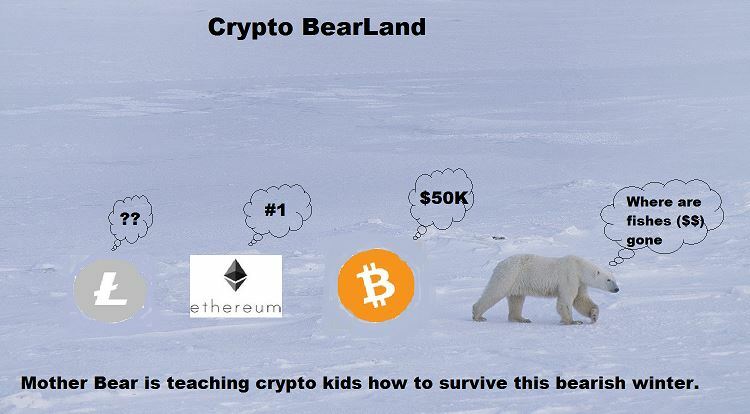 Tips for survival – Crypto BearLand for investors. While crypto Kids are in capable hands investors dont have that favour, In the recent market environment, it is becoming gradually difficult for Crypto investors to stay positive when looking at their portfolios. BTC has dropped by over 80 percent year-to-date and the altcoin market is down by even more. These are the tough time for crypto investors, especially those who entered the market amid massive bullish period. But that doesn’t mean that nothing can be done to minimize losses and generate profit too. Here are some tips that will give you an edge in crypto Bearland. Hedge your portfolio by shorting Bitcoin. One of the easiest and most common ways to manage a crypto asset portfolio in a downturn is to support your portfolio with a bitcoin short Trade. In other words, you short bitcoin so that the drop in the value of your portfolio is partly or wholly offset by the profit from your short trade when the market declines. For example, if your Cryptographic asset portfolio is currently worth around $10,000, you could enter into a short BTC position at a CFD broker that supports the BTC trading pair. You could set the hedge ratio to 70 percent, so that a drop in portfolio value would be covered by the profit from your bitcoin short trade. It means your portfolio would only lose around 30 percent of value if market choose to go down and down. Rebalance your portfolio towards Stable coins. Despite all the controversy surroundings Tether (USDT), it comes as no surprise to see the cryptocurrency equivalent of the US dollar still in the top ten leading crypto assets by market share, while the market continues to tumble. Many investors are moving their funds from crypto assets into “Stable crypto coin” while markets are bumpy, so that they can re-enter the market at a more opportune time without the fear of losing money due to crypto market instability, also with GUSD, TUSD, USDC there are a lot stable coin to shift too. Investors who are well versed with trading and have previous experience can actively manage their crypto assets holdings, by changing from a more passive portfolio management approach to swing trading may see a pay off through a bear market. Swing trading refers to actively entering and exiting positions within a matter of days or week to capitalize on short-term market trends. This strategy could work well for experienced traders who can judge market-moving news quickly and are capable to position themselves accordingly to profit from resulting price movements. With volatility again in two digits in market this is a good option to make money at this time in crypto markets. 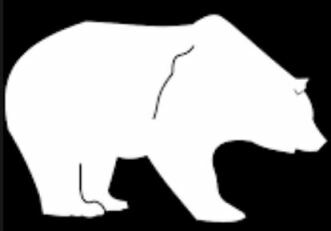 Considering the time crypto have to venture ahead in Bearland its better to choose what suits you more of above tips to get through this bearish period until Bullish wind and whales come.